At the beginning of the conflict, the American Revolutionary Army stood with 20,000 men. However, by December the revolution was in trouble. Without a victory against the better trained and larger British army, the American army was being chased from town to town and morale was dropping. By the middle of December the numbers of men had dropped to about 2000, most of whom were in their teens. So serious was the situation at this time that it might well have been the graveyard of the hopes for freedom. Murmurs of dissatisfaction were heard, and whispers of discontent with Washington's leadership resounded back to his ears. And with the loss of Trenton, the British were beginning to celebrate victory. They jubilantly proclaimed, "That most dangerous and unprovoked Rebellion that ever existed," was about to be completely destroyed, and that, "the business is pretty near over." It only remained to mop up the last pockets of resistance. "These are the times that try men's souls. The summer soldier and the sunshine patriot will, in this crisis, shrink from the service of his country; but he that stands it NOW, deserves the love and thanks of man and woman. Tyranny, like hell, is not easily conquered; yet we have this consolation with us, that the harder the conflict, the more glorious the triumph. 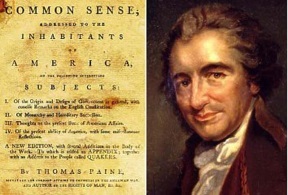 What we obtain too cheap, we esteem too lightly: 'tis dearness only that gives every thing its value. Heaven knows how to put a proper price upon its goods; and it would be strange indeed, if so celestial an article as FREEDOM should not be highly rated." 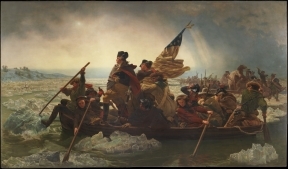 After four months of desperate retreat across New Jersey, George Washington decided on a final gamble -- to re-cross the ice-filled Delaware River and attack some 1,200 Hessian mercenaries at Trenton, the same mercenaries who in earlier battles had struck terror into the hearts of his men. On Christmas Day in 1776, Washington ordered Paine’s “The American Crisis” read to his ragtime band of teenage fighters. That night they crossed the river and by morning were at Trenton. The Hessian’s were caught by surprise and before they could assemble their arms to fight, Washington’s exhausted army had them surrounded. With their commander wounded, and many of their men killed and wounded, the Hessian’s surrendered. Washington, fearing the worst, asked for a list of casualties. To his amazement, not one American soldier had been killed. He quickly took his prisoners and marched back across the river before British reinforcements could arrive. 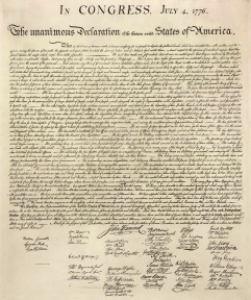 Washington had his first victory, and in the cold bitter reality of defeat and death, a nation was born. Helaman wrote, “they did think more upon the liberty of their fathers than they did upon their lives; yea, they had been taught by their mothers, that if they did not doubt, God would deliver them” (Alma 56:47). Later he wrote, “Behold, I numbered those young men who had fought with me, fearing lest there were many of them slain. But behold, to my great joy, there had not one soul of them fallen to the earth; yea, and they had fought as if with the strength of God” (Alma 56:55-56). While Washington’s continental army on Christmas Day 1776 may not have been taught as had the sons of Helaman, “the power of God was with them” (1 Nephi 13:18) and they “were delivered by the power of God” (1 Nephi 13:19). Hold to the Rod Click Here! Newer Post“According to Their Needs and Their Wants” (Mosiah 18:29). Older Post"He Prepareth a Way to Accomplish All His Works" (1 Nephi 9:6).